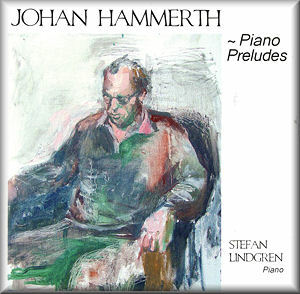 The Swedish composer Johan Hammerth (see website) confesses that he cannot stop writing Piano Preludes. By December 2010 he was working on his 48th. His creative compulsion can be traced to his hearing the Shostakovich preludes and fugues. He tells us that in 1999 he wrote 24 preludes and that these “emanate from four basic moods, with six different expressions. Some of them have an affinity with each other.” Numbers 25-32 are for the left-hand and are dedicated to the poet Thomas Tranströmer. Hammerth’s idiom accommodates gently-stated dissonance and does so within unadorned resounding textures. He presents his often obsessive and repetitively patterned ideas in subtle mesmeric monochromes. The element of repetition and the bare landscape allows the listener more easily to appreciate these very serious pieces most of which run between 3:30 and 6:00. A good example is No. 3 which has a nagging carolling note-cell around which other cells are steadily swirled. The writing can be assertive, protesting and driven. And when it is not following this path Hammerth tracks his concentrated way through dreamy nocturnal territory as in the Chopin-reminiscent Nos. 25 and 28. It may be that there is more dynamic variation in this music than we hear in this recording. Despite the Shostakovich exemplary fugal activity is not part of Hammerth’s armoury - at least not here. The romantic Russian piano tradition means a great deal to him and you can hear this at the start of Preludium 11 and the truly breathtaking and slow-babbling 31. He was born in Kalmar and educated at Stockholm's Royal College of Music (1982-1990) where his teachers included Sven-David Sandström, Pär Lindgren, Daniel Börtz, and Lars-Erik Rosell. His Piano Concerto (1989-1990) was dedicated to Sven-David Sandström. His Piano Concerto No. 2 (1993-1995) was premiered by Bengt-Åke Lundin. While the piano is at the core of his creativity he has said that string instruments are his "musical lungs". His catalogue includes three string quartets (1989, 1995, 2003), Symphony No. 1 (2000), Stockholm Cantata (1997), Eruption (1987) and Confront (1985) for orchestra and a series of concertos for violin (1987, 1994, 2002), cello (1998), percussion (1995), Flute (1992) and bassoon (1986). Pianist Stefan Lindgren, who is also a composer, here plays 17 of the preludes (here termed ‘Preludium’) and does so with every appearance of total absorption in these substantial pieces.. It’s a liberal assortment with the disc running close to capacity. We are told there will be more to come in a further CD later in 2011. The second disc will be worth looking out for and I hope soon to hear his orchestral concert music. This is music that weaves a hypnotic spell. It is deeply romantic and seems to speak of losing the self in contemplation.